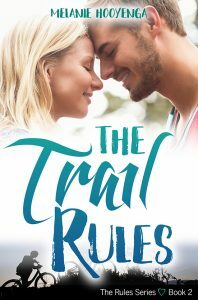 We were so excited to welcome Melanie Hooyenga this month to the Sweethearts of YA site, and we are even more excited for the March 9 release of THE TRAIL RULES, the second book in her RULES series. To celebrate, Melanie has offered to give away a print copy of the book (U.S. only) to a randomly selected winner. All you have to do to enter is leave a comment sharing one of your non-negotiable rules of love. What makes or breaks the deal for you? Bonus entry: Tweet a link to this post using the #SweetheartsofYA hashtag! Respect is my serious answer. Humor is my real non-negotiable. Trust!!! For me once you lose that, it’s so difficult to really trust again. There will always be a shadow of a doubt in my mind. Don't miss a single contest or post! Enter your email address to subscribe and receive notifications of new posts by email.